How Wet Underfloor Heating Works? How Electric Underfloor Heating Works? Underfloor Heating Mats 150W/m² Premium Danfoss Electric Mats. Highest quality and unrivalled 20 year full replacement warranty. 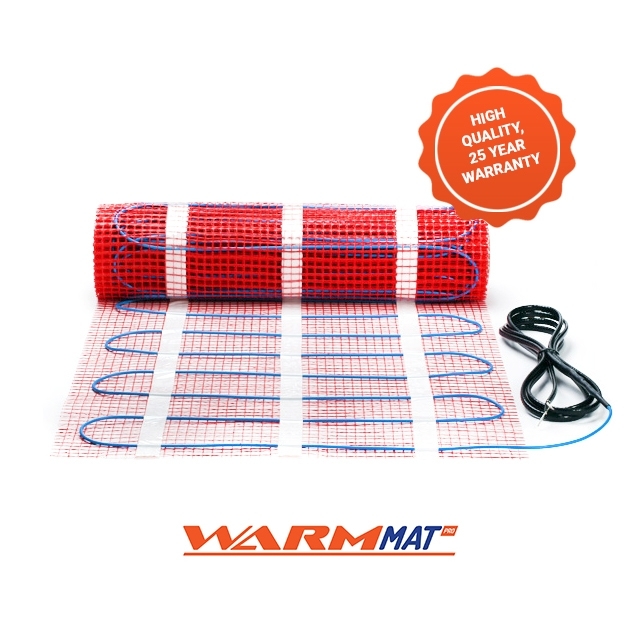 Ready to lay and easy to use the WarmMat Pro Mats are of a high quality and offer a reliable solution to electric underfloor heating coming with a 10 year warranty. Available from 2m² to 12m² in 150W/m². Excludes orders with XPS Insulation and Levelling Compound. Send us your floor plans and we will create you a free no-obligation specification & quote. Always read the instructions carefully. All electrical connections must be made by a qualified electrician to the applicable regulations. All electric underfloor heating systems must be RCD protected. 100w mats should be used where fitting directly to timber substrates. 100w and 150w mats can be used with any floor covering (see flexible levelling compound section notes) and on insulation/backer boards. We recommend 200w mats are used for high heat loss rooms (tile use only). We recommend the use of insulation and/or tile backer boards underneath the mat to ensure optimum performance, reducing downward heat loss and to provide a faster warm up time. We recommend the use of levelling compound (minimum 5mm for tiled finishes) over the electric mats. This will provide an improved performance and leave a surface suitable for the tile covering. A minimum of 10mm self levelling should be used for any other floor finish (with exception of insulative floors, such as: bamboo, rubber back carpet, cork etc). Always check with the manufacturers recommendations when using their products with Electric UFH. The maximum load per thermostat should not exceed 3600w (for example 24m² 150W/m² mats). Where loading will exceed 3600w, a suitably rated contactor must be used (refer to your qualified electrician). Please double check all dimensions before attempting to lay the heating elements, allowing for fixed furniture, such as, sinks, bath, shower trays, kitchen units, islands etc. The cables cannot be shortened, so it is important to get the sizes correct. Use flat bottom furniture with no air gaps, such as bean bags, mattresses, sofas with no feet, pet beds, rubber back carpets/rugs. Anything that may create a thermal blockage, as these are potential hazards. Switch the system on too early and let the compounds dry out completely. Leave it longer if installing in colder ambient temperatures. Fill if the form below and a member of our team will get back to you as soon as possible. Warranties/Guarantees are offered by Underfloor Heating 1 and are not insurance backed.